Well, running NaNo really paid off, as I just found I have nailed down yet another book. It was a massive writing spurt, 4 hours each day every day for 3 weeks, summing a grand total of 72755 words, 191 pages in format. Now some of this might need ‘splaining. First and second row are day and date (duh), then there is word-count. With 30 days (1 day spare) to write 50.000 words, this comes down to 1666 words a day, leaving 20 for day 31. Then there is expected book count. This is what I minimally have to be on at the end of each day. At the top there is the number 3111, which just happened to be how much words the book already had when I started for layout and research. Then it just ads up the word-count of that day plus the amount for layout. Then there is double word-count and expected book count, which is the same as word-count, but has to run to 100.000 words, so it will be 333 words a day, and it does the same as the first word-count. 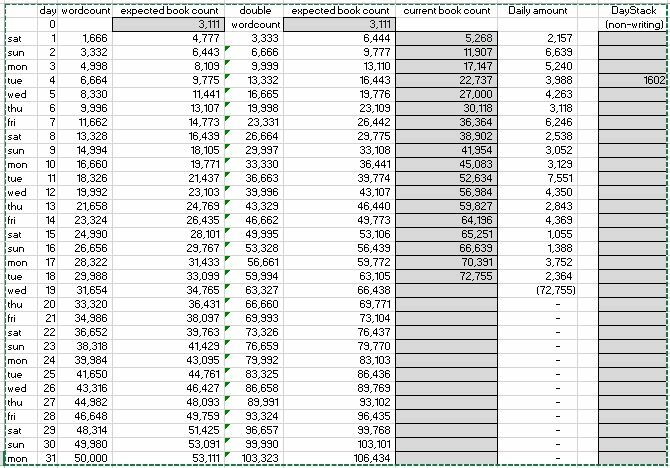 Current book count is just the word-count taken directly from Word in which I write, after which there is daily amount, which is the word-count of the day minus the word-count of the previous day. The last table is Stack, which I used for adding extra research. Looking back I could probably have pushed the 3111 into stack, but I never did as this just seemed more practical. And this is how I ran my NaNo, simply by adding and updating my current book-count until I had enough. And it gives such great insight. Sunday 2nd of November I had such energy, such drive. The story was just taking off and I just ripped through those pages and I had pretty decent numbers all week. That next weekend things dipped a little, but built up to the 7551 spike in Tuesday. That next weekend though, oh boy. I was feeling ill, the story didn’t seem to run anymore and we just had our hands full with birthdays. But still the Monday and Tuesday brought it to a nice ending. So This is how I NaNo. NaNoWriMo is just about sticking with it and not giving up, getting that word-count and maybe push on, or in my case, go totally overboard. I have never written a book like this, just hammering it down four hours a day until it was done and to be quite honest I feel like I have gone through the wringer. But I know it was worth it. This entry was posted in Exodus of Mars, nanowrimo, personal, science fiction, writing and tagged Exodus of Mars, future fiction, nanowrimo, personal, publishing, science fiction, writing. Bookmark the permalink. Wow, that’s so impressive! So far I’ve been too chicken to NaNo but I greatly admire those who do. This is similar to how I Nano-monthly, except I still don’t have a spreadsheet that keeps up with word count the way I like it. Otherwise, I try to average about 5-10K words a day. Keeps my brain jumping, to say the least. 10k a day is quite a feat, that must be around 4 to 6 hours a day of work. Well done. You must be the most organized Wrimo I’ve seen so far. Congratulations on finding a system that works for you and for finishing your manuscript early! Well I have been writing for several years now. NaNo is more of a challenge for me than it is a competition. I don’t even register as I would rather see the prizes go to other people.